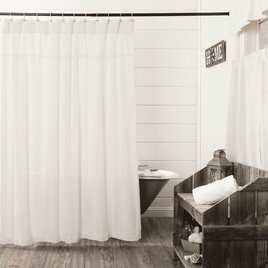 Brighten up your bathroom with the fresh, clean, Burlap Antique White Shower Curtain. Featuring soft antique white cotton burlap & a fringed edge for added texture on the top section. Finished with a standard 2 inch hem fold at the bottom. 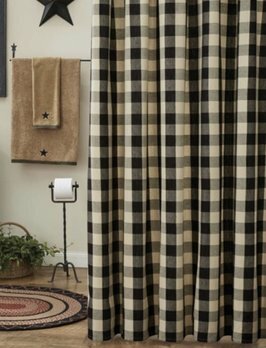 Bring a casual farmhouse vibe to your bathroom with the Sawyer Mill Charcoal Stenciled Patchwork Shower Curtain. 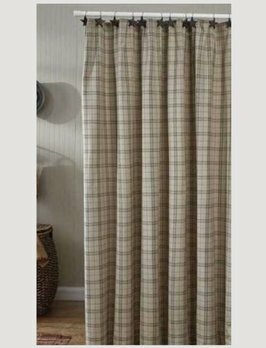 Features an irregular block layout in various plaid & striped fabrics, accented by stenciled farm themes on textured khaki chambray. 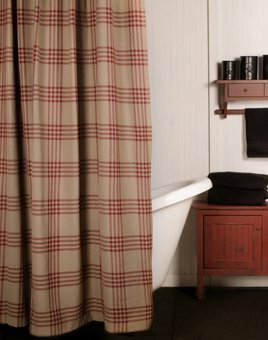 The Sawyer Mill Charcoal Farmhouse Shower Curtain brings a casual farmhouse look to your bath. Features textured, khaki cotton chambray base fabric accented with the word "Farmhouse" in distressed black, with grain sack stripes above and below it.